This tour was amazing. Our tour guide Indrajeep was friendly, informative and had a lot of knowledge about the religion and history of India. I am so glad we booked this tour as we were able to experience the culture and religion of India. We accidently booked our tour for the incorrect date, but Indrajeep was able to still go ahead with the tour which was last minute notice and also booked us another hotel at the Raddison which provided beautiful food and the hotel was clean and we had no problems. Indrajeet made sure we saw the main places in Varanasi and ensured we were safe at all times. 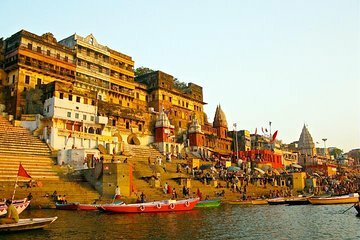 We really enjoyed our tour of Varanasi: good value! Very much appreciated being met at the airport Mr. A. Kumar and being driven about my Mr. Dhanusdhari. Above all, our guide, Mr. O.P. Kushwaha was excellent. The hotel Radisson was lovely including the buffet breakfast. The only downside was that we were not within walking distance of the Ganges River so were not able to freely/easily wander to explore more of that area. Tours were shortened due to heavy traffic. I don't know how we ever would have seen all we saw without this tour and our guide Achilles. The service we received was exceptional from start to finish. The patience of both guide and driver and their willingness to modify the schedule - we spent less time in museum and more time walking on streets - was perfect. Seeing Varanasi in only two or three days you really need someone local to show you around so you don't miss the best parts. Achilles knew exactly what time we needed to be in each place and got us there easily. Driver was amazing through all the traffic and being in a car was helpful with all the dust there is on the streets. It's an amazing place and our favorite so far in India. Not to be missed.